You lean back against the wall, your favorite scotch in your wrinkled hand. It has been changed over the years, as everything in your favorite tavern has. The floor doesn’t squeak as loudly as it used to. The twisted wall panels are covered with fancy wallpaper. Even the patrons have changed. No longer is this the loud tavern that you used to sweep of broken glass at night. Now this place is filled with the low murmur of the rich. It is for vendors to sate their thirst or to drown their sorrows in the truth of their not so opulent realities. So is life. It all has a way of changing. You take another sip–you used to take swallows–of the cool scotch. Carbonated. That’s the word the barkeep had used. He’d said he was just trying it out to see if the patrons liked it. You chuckle. Bad scotch needs disguising. An elf bursts through the doors from the busy venue, covered in dark billowing garments befitting the Grand Vizier himself. He’s young. At least, he looks and walks young as he treads confidently over to the bar. You’ve never been good with guessing the ages of elves. They live so long that your ninety years would put one still in his puberty. Another sip and you set your scotch down on the bar to watch. You’re intrigued with young aristocrats. With a raise of his finger the elf has his usual in hand. Yes he’s been here before, but never noticed you. Once a week he can be heard outside plying the cause of his favorite not-for-profit. The elf catches your eye and makes his way toward you at end of the busy bar. He must have noticed you when he came in because he smiles at you. You run your fingers through your thin hair and return the smile. He was hocking the name of ELDER: Enlist to Love, Donate to Enrich, and Revitalize. He probably thinks you’re one of the “poor unfortunates” who needs saving. He does, taking the stool next to yours. “I’m Dartaa. Student at Grand-Visage Academia.” He takes a measured swallow from his glass. “Pleasure. What brings you here sonny. To talk with an elder of wisdom?” You raise your scotch. “Who heads up ELDER?” You ask honestly. You speak sincerely, “Elacious said himself, to my ears, in the truth of the spirits he’d been drinking, that his organization receives so many donations that he needs spend only one-fifth on the actual homes built. He said another two-fifths go to employees and advertising.” You pause and lean closer still, smelling the liquor on Dartaa’s breath. “Elacious whispered to me, ‘I pocket the other two-fifths, geezer.’ With that he slipped me this.” You hold up a small god bar. You don’t know what to say. The boy is a fool to give to something for a century without knowing everything about it. But saying that won’t ease the pain in the face before you. “I’m sorry son.” You manage. Without knowing why, you slip the gold bar into his breast pocket. Dartaa rises to leave. You watch the elf. A solemn taste in the back of your throat. Yes all things change. Even the longliving young. You lean back against the wall. Just 37 Hours Remaining!!! 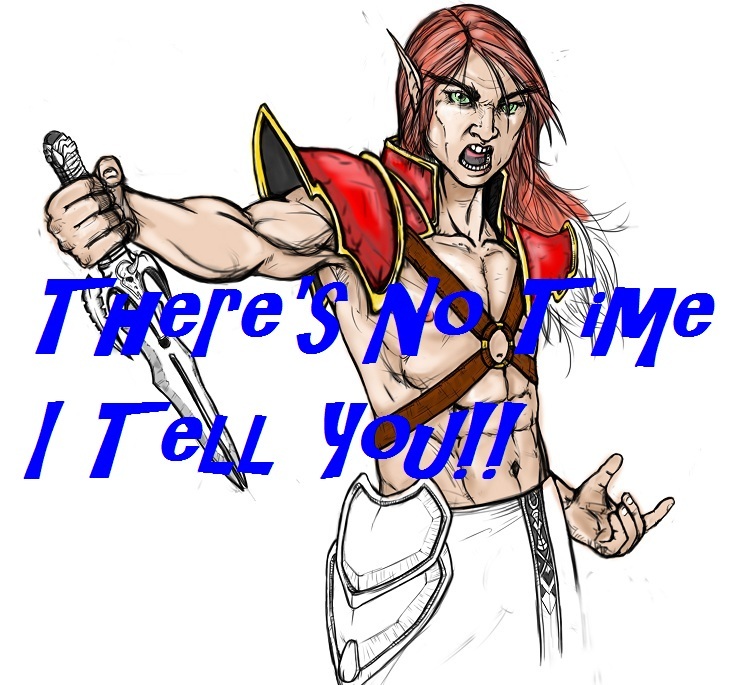 “Tell Us Your Elven Story” Writing Contest!!! Been Thinken About It, But Haven’t Made The Time, Or… Or… Any Other Thoughts That Might Be Stopping You?